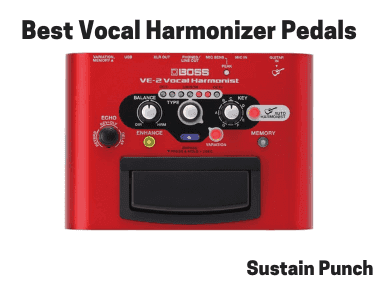 What are the best Vocal Harmonizer pedals and Vocal Harmony Processors for Live Performance use in 2019? 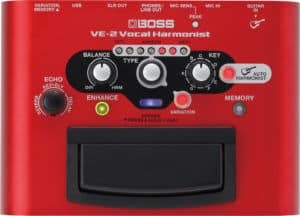 Boss VE-2 Vocal Harmonist Pedal – Editors Pick! Well, let’s talk about them! Vocal Harmonizer pedals are great for singers looking to create additional vocal harmonies in their live performances, which are perfectly in tune with the lead vocal. These vocal harmonizer pedals are suitable for solo singers and bands, where either, there aren’t any backing singers or the other band members cannot sing. Vocal Harmonizer effects pedals, also known as vocal harmony pedals are widely used by the majority of current music industry artists looking to recreate their studio recording sound, within their live performance. We realise that singer/musicians can be highly critical about the sound quality of their vocals, particularly for a solo singer, who cannot afford the privilege of hiding behind a lead guitar part. Vocal Effects Pedals give singers that extra vocal edge, adding to the overall live performance. Therefore, each of the voice harmonizer pedals we have provided, give the ability for the user to make detailed adjustments and tweaks to the overall vocal sound. Some of the pedals featured, also integrate with the singer’s secondary instrument (guitar, keyboard) to follow the chords played, accounting for key changes. Not got as many features as other pedals (However, don’t get me wrong, this is an ace vocal harmonizer pedal. Let’s save the best until last, the Boss VE-2 harmonizer pedal is last addition to this list. It combines the sounds of Boss/Roland VE range, providing a high quality, studio-like vocal sound for your live performance (Take a listen to the demonstration video below). The Boss VE-2 pedal is highly portable and easily stored, being only 600g in weight and relatively small in size. Alongside the physical aspects of this pedal, making it a great choice due to its portability, it also has the ability to be used entirely on battery power. A battery-powered stompbox is especially helpful in the live show environment. Whether or not you are busking on a street corner, or playing a staged show, mains plug sockets can be rare to come by, often being reserved by the excessive amount of pedals used by the lead guitarist and bassist. Now, let’s get to the vocal harmony pedal’s usability features. There are two main pitch settings to keep harmonies synchronised with your lead vocal. The pedal naturally listens to the chords that you’re playing with your guitar or keyboard, and it can also be manually set to a specific key. Combining these two features will give you the most reliable results. However, if you have a song which includes a key change, we advise that you do not input the specific key. The Auto-Harmony function is a great addition to this pedal, as we know full well that technicalities should be left to the side once you hit the stage… That’s the time to give your performance! The VoiceTone H1 is one of the cheapest Vocal Harmonizer Pedals, however just because it’s lower in price doesn’t mean it’s lower in quality. In fact, this pedal gives some great sounding vocal harmonies, as you can hear on the demonstration video below. The user has access to three turnable knobs, giving the ability to choose the songs musical key for the pedal to use, alongside the precise vocal interval for the backing harmony accompaniment. The final knob controls the volume level of which the accompanying harmonies can be heard, relative to the lead vocals. The main disadvantage of this pedal, against its competitors, is that it’s still as expensive as other pedals on the market, which have more functions. 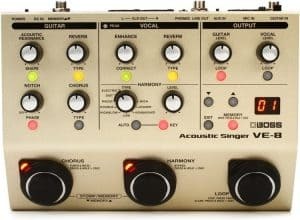 Also, considering the price, although it is more than half the price of some harmonizer effects pedals featured here, through paying the extra money, you can get an all-in-one vocal solutions processor which could save you money in the long-run, if you were considering purchasing each vocal effect separately. 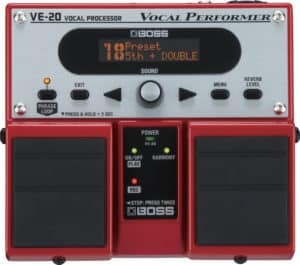 The BOSS VE 20 Vocal Performer is not primarily a vocal harmonizer, it’s essentially an All-in-One vocal stompbox, and being designed and produced by Boss, you know it’s high quality. Being 1.6kg it’s not the lightest pedal in the world, but it more than makes up for it in its ability to add multiple layers of vocal harmonies, add creative vocal effects such as distortion, strobe and radio effect. It allows singers to also use real-time pitch-correction, which is highly important, to make sure the vocal harmonies are in tune with the lead vocal. The BOSS VE 20 provides additional features, being an incredible autotune pedal for vocals. This pitch correction function is highly important, to make sure the vocal harmonies are in tune with the lead vocal. Also allowing 38 seconds (mono) of looped recording, which is useful for singer-songwriters looking for a creative, innovative way to build up the instrumentation, layer by later to their live song, directly in front of their crowd. The pedal includes Phantom Power, so it is able to power condenser microphones, such as the Rode NT2A. Cannot be used without an instrument plugged in, to follow chords. Doesn’t include autotune, as other pedals do. The TC Helicon Harmony Singer 2 is a harmonizer pedal, devoted entirely for singer/songwriters and singers in bands. For this pedal’s harmony functions to operate, an instrument must be plugged in so that it can follow the chord progressions. The pedal has three main turnable knobs located on the front, ‘Harmony’, ‘Level’ and ‘Reverb’. Harmony refers to the specific pitch interval you wish to set, Level refers to the volume level to which these additional harmonies can be heard, and finally Vocal Reverb. The pedal sounds extremely versatile in the way it can be used for different kinds of music, from Metalica & Iron Maiden to The Beach Boys. The vocal harmony pedal has a fully automated sound enhancement function, at the click of a button (Tone). This includes Equalisation, Compressing, De-Esser and a Noise Gate, all of these brighten up the vocal sound, whilst maintaining a nice level of dynamics to studio polish the live performance. For a real look, please refer to the demonstration video below. As you can see, the tc helicon vocal harmonizer pedal is particularly impressive. The VoiceTone Harmony-G XT is more than just a harmonizer pedal, it’s an entire vocal solution for singers. It includes a range of harmony options, vocal doubling effects, reverb, pitch correction (auto-tune), vocal tone control (EQ) and A/B switching between saved vocal effects. Certainly a heavier pedal than other options, at 1.3kg, but it’s wide range functions certainly makes this extra weight perfectly acceptable. The benefit of this vocal harmony processor stompbox is that it provides real-time vocal pitch correction. This prevents the audience hearing an out-of-tune lead vocal, which could be emphasised with hearing a perfectly in-tune harmony vocal line alongside an untuned lead vocal. 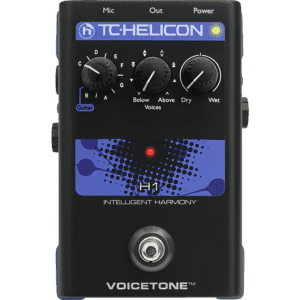 Thank-fully VoiceTone has carefully thought about this product, creating a fantastic sounding all-in-one vocal harmonizer pedal. The Boss VE-8 is ideal for the singer/songwriter who is looking for a vocal pedal which has vocal harmonizer effects, amongst others; But also offers the user effects for their acoustic guitar that can be used in synergy with the vocal effects. This means that you can have all of your vocal and guitar effects tare taken care of in a single unit. Stand-Mountable vocal harmonizer and effects unit (Harmony, Reverb, Echo, Pitch Correction) & Anti-Feedback button, and Added Tone button to provide Automatic EQ, Compression, Filters. Built-in Room sense microphone to automatically detect pitch for harmonies. The TC Helicon Perform VK is the ideal vocal processor for pianists and keyboard players, with this device having a range of functionality; TC Helicon has really created an effects pedal that can be used both in live performances and studio recordings, with the sheer quality of internal hardware. The interface is incredibly easy to use, and the device can be used with a 3 button, or 6 button foot pedal to allow for ease of switching between effects during a performance. Coming from TC Helicon, we’d expect nothing less than perfect, and this harmonizer pedal delivers an assortment of hundreds of effect combinations, for your choosing! High Quality, Sturdy Chasse, for the musician who’s taking this thing on the road. The TC Helicon Play Acoustic is the ideal all-in-one effects processor for singer/songwriters who play the acoustic guitar and want an effects pedal which integrates vocals and acoustic guitar. This device is a premium-grade vocal and guitar processor, and as you can hear from the demonstrations, offers superior sound quality. Now, this particular processor will be the perfect multi-effects processor for most professional singers. The only downside to this device is that it lacks the Midi Synchronization that the original version has. The multi-effects vocal solutions we offer are certainly a must for singers looking to transform their performance. For under $300 you can have a pedal for both studio/live use that has a surplus of functionality.